What is Salsa? - Strictly Salsa 4 U presents - S A L S A !! You might know it as a spicy sauce in Spanish? Salsa music? Salsa dance? Yes. It's all the above, however in our case we are interested in Salsa Music and Salsa Dance. Salsa music created by Spanish-speaking people from the Caribbean. 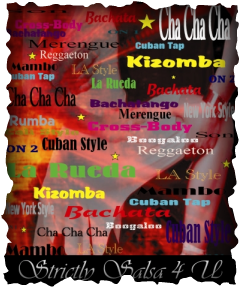 Salsa dancing mixes African and European dance influences through the music and dance fusions that are the roots of Salsa: Son, Guaguancó, Rumba, Boogaloo, Pachanga, Guaracha, Plena, Bomba. Salsa is normally a lead & follow (freestyle) partner dance. We need Salsa music to dance Salsa. It's the music that determines the style of Salsa we dance. Salsa music traditionally utilises a 4/4 time signature. Musicians play recurring rhythmic accompaniments often in group of eight beats (two measures of four quarter notes), while melodic phrases span eight or sixteen beats, with entire stanzas spanning thirty-two beats. While percussion instruments layer several different rhythmic patterns simultaneously, the clave rhythm is the foundation of Salsa. All Salsa music and dance is governed by the clave rhythm from the Cuban Son. The most common clave rhythm is Salsa is the Son Clave, which is eight beats long and can be played either in 2-3 or 3-2 style. There are many musical styles in Salsa music. Such as Mambo, Merengue, Boogaloo and Cha Cha Cha to name a few. A Mambo song is different to a Merengue song. This means the dances are different to each other. A Mambo song tends to be fast, brassy and with some elements of Jazz sprinkled here and there. The dance step would be 1,2,3 5,6,7 over a 8 beat count. Merengue, for example tends to be slower and rhythmic. The dance step would be 1,2. Why do we have so many different musical styles in Salsa music? Each of the Spanish speaking Latin countries in South America and the Caribbean have their own traditional music and dance.